Whether it was Sarah’s loud, musical burps, Maggie’s cat noises, the uncountable times our ASB team has bonded on a personal level, or the amount of insight we have gained dealing with all aspects of immigration in the United States. I thought I was decently informed about the issue before the trip, but it turns out that I was vaguely educated. For starters, San Juan, Texas was very welcoming. I felt at home seeing a vast population of Hispanic people, reading signs in Spanish, feeling the warm, invigorating weather, and – most importantly – eating homemade Mexican food! I appreciated the fact that our learning partner, John-Michael Torres, who works for the non-profit organization LUPE (La Unión del Pueblo Entero) we partnered with, taught us about immigration in the US without sounding politically biased. I won’t forget the march we did on Martin Luther King Day (how convenient :) ), which was to celebrate and accept individuals of different races, economic backgrounds, citizenship status, and sexual orientation. I was dumbfounded when I realized that it currently takes up to more than 10 years to be granted citizenship/residency here, especially in terms of marriage. Also, I did not realize how privileged and lucky I am after hearing stories from undocumented immigrants who live in “colonias” and strive to attain a college education. Witnessing “colonias,” low income communities established outside city limits with large populations of migrant workers, was eye-opening to me. I thought it was cruel and inhumane to see that undocumented immigrants do not have proper plumbing and electricity nor someone to pick-up their trash. The whole time I pondered, “This is the United States?” I honestly felt like I was in a third-world country. It is inspiring that immigrants still try to make the best out of their lives here. 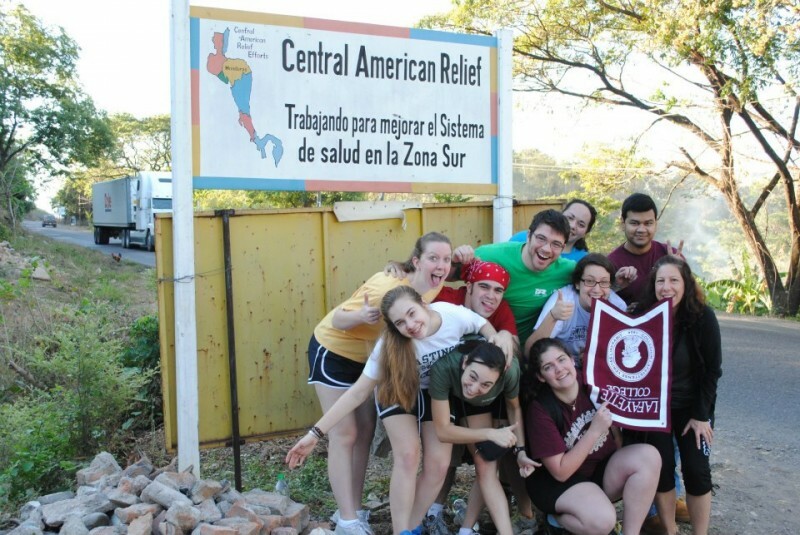 I am eternally grateful for being part of this service-learning project, but I know I can do more by educating students on campus or spreading the word about the impoverished lifestyle in colonias. I hope our team will be able to bring all the experiences we had with LUPE to Lafayette. It’s been about a month since we left for Honduras, yet I still have trouble finding words to adequately describe the week we spent working with CARE. My experience on this ASB trip was without a doubt, however, life-changing for me: it completely reshaped how I view active citizenship, the state of rural healthcare in Central American countries, and the commonalities among all people, no matter what our geographic differences may be. I loved every minute I spent in Honduras with my ASB team, and it was an absolute honor to be able to participate in this experience with them. Through working in the clinics taking blood pressure, pulling teeth, and filling prescriptions, we were able to learn firsthand the conditions and limitations surrounding healthcare standards in rural Honduras. Items that many Americans take for granted like antibacterial soap and antibiotics are rare commodities in Honduras, and healthcare professionals are limited in the care they could provide rural Hondurans because of supply restrictions like these. It was really humbling to learn that such healthcare standards are not unique just to Honduras or to Central America but are present in many areas of America as well. One of my favorite days of our trip to Honduras was the cultural day, in which we traveled to a remote village in rural Honduras and participated in traditional Honduran games and rituals with the villagers. Despite the language barrier, I’ve never felt so welcomed by a community. Each and every Honduran we met during our trip showed us the utmost warmth and hospitality, and this is an aspect of Honduran culture I will never forget. Overall, my ASB trip to Honduras is definitely one of the best experiences I’ve had in my life so far: the immersion into Honduran culture, the amount I learned about myself as both a person and a volunteer, and the amazing new friendships I made set this trip apart from anything else I could’ve been doing over interim. I’m so grateful to have had this opportunity and can’t wait to delve into the social issue of rural healthcare even further through our upcoming reorientation project! Almost a month after our departure date, I find myself still constantly thinking about our trip to Honduras (not only because I’m still taking my malaria medication). What we experienced on our trip can’t be put into words, but I will try my best. Each day we embarked on a journey to a rural village in southern Honduras, where our team was responsible for setting up and operating a health clinic. At all times, I felt immersed in the Honduran culture, whether it be playing with the children waiting at the clinic, or filling prescriptions in the farmacia. Overall, the trip was incredible, and we have done our best as a team to realize that the issues of poverty, malnutrition, and poor/lack of healthcare are not isolated in Honduras, but exist in our country as well. We are working on our reorientation project to bring these issues home and inform the campus about our transformative experience! 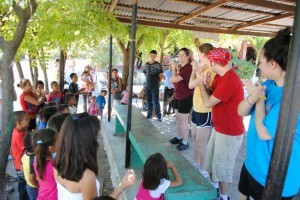 Honduras was in one world–humbling. Experiencing an under-developed country firsthand and facing the daily struggles and problems that the natives faced was an amazing experience. I am so glad I decided to go on the trip, it was well worth it. It feels like only yesterday I was spending my 19th birthday there and getting beaten by a piñata. I remember waking up at six am just to get to the clinic on time. I was always remember the pulling of teeth that the dentist allowed me to do. Not only did I first inject the gums with anesthetics, but then uprooted and pulled out two teeth from an older woman. I remember her vividly because she only had about three teeth on the right side of her mouth, I pulled two teeth from the lower front side of her mouth, and she had about only six teeth left of her left side. By the end of the trip I was severely sunburned, but I did not care. I just kept thinking about how much of a difference us Lafayette students made in Honduras and will forever be remembered among the natives. It was not just Rosa or the little children that we will never forget, but they will never forget us. Americans are a rarity in southern Honduras and I just hope that our warm white smiles will always be remembered among the people. I had a great time and the best birthday ever. On January 18th we embarked to Honduras, not exactly sure about the work we were going to develop within healthcare there, but with a lot of expectations and willingness to help others. 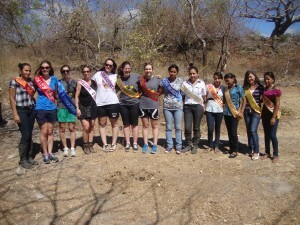 Many meetings and a lot of preparation were held prior the trip, besides the fundraisers we were doing. It was definitely a lot of work, and it will continue like this until the end of this semester. However, all the work is absolutely worth it. Our trip was awesome. 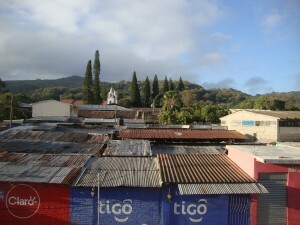 We arrived in Tegucigalpa, Honduras’ capital around midday. Kristi, Marc and Andy, members of the Central America Relief Effort (CARE), were waiting for us at the airport. 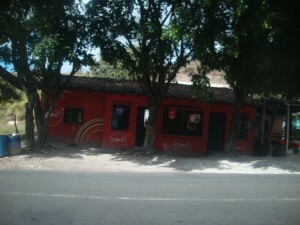 We had lunch in a wonderful restaurant downtown and then we headed to Pespire, a town in the Choluteca region. During the ride, Andy started explaining to us how our next days would be, helping people in three different towns in the South of Honduras. In each town we would go to schools or another building in town and build a clinic to receive people from the region for the day and at no cost. At arrival, Barraza, one of CARE members, would get their information, as name, age and we were responsible for taking their blood pressure. After that, they would go to the general physician, eyes doctor and dentist. All medicines prescribed by the doctor would be available at the “farmacia” for free. After that, they would get donated clothes that CARE receives or glasses, in case the eyes doctor had prescribed so. Andy explained that our role in the clinics was to take their blood pressure, lead them to the doctor, organize and find medicines in the farmacia, hand them the clothes or help the dentist Gabi. In some towns we were also playing with the kids while their parents were with the doctor. Therefore, we were developing a hands-on work, interacting with the Hondurans directly and feeling very well integrated to the CARE group. Doubtlessly, this made our experience way more fruitful, and the learning was frequent. If it was either taking blood pressure or playing with the kids, each one of these duties that we developed provided us with a great opportunity to know more about that people and about their conditions. 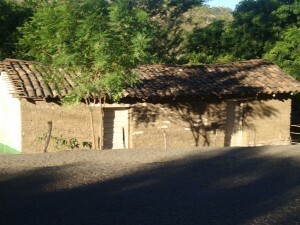 In one of the towns, San Marco de Colón, I was especially surprised with the high level of malnutrition. We saw kids who could not stand on their feet, and many adults who didn’t have enough information to know how to deal with it. Many people had really high blood pressures. We saw people who walked for hours to get to the clinic, because that was the only healthcare they would get maybe during the year. However, it was impossible not to be moved with the smile they were receiving us and the gratitude they showed us for being there. On my first day, while taking blood pressure with Alana, an old lady came to us, holding our hands and we could see in her eyes that she was happy because we were there. There was nothing left to say, we didn’t need to understand any Spanish to know exactly what she meant. 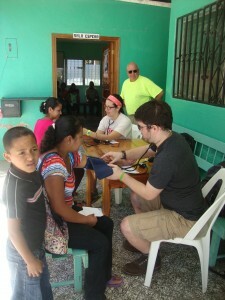 Outside of the clinics, we also learned a lot. 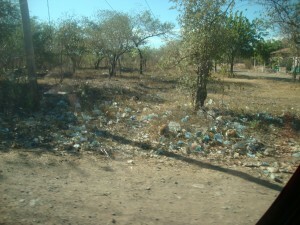 For instance, just by driving on the roads, we could see a lot of trash on the street. However, at least if there was trash, it was a sign that there were people living there, and that they were eating something, consuming something to survive. I would get more worried about the regions we went were there was absolutely no trash, but we could see houses by the road. I couldn’t understand how people there would get water or food or any other kind of services. This would explain why some people were malnourished. The roads were terrible, and accessing those remotes areas was almost impossible by car. In one town we went, 15 minutes away from the borders with Nicaragua, it was easier for the population to go to a Nicaraguan hospital instead of going to the nearest Honduras hospital in the area. All this taught me the value of small things we take for granted in our countries. Especially for me, coming from Brazil, I could see that this same reality of extreme poverty exists in my home country, however, I was lucky enough to never go through any kind of these experiences, although this reality was always so close to me. Our view from the hotel where we stayed in San Marco. In addition, I could not write without mentioning some small moments that led to deep learnings, which I am going to take for my whole life. On our last day we met a lady, Rosa, who was 105 years old. At first, I was escorting her to the doctor, afraid she would fall, but she was actually walking faster than me. Heading to the “farmacia”, the doctor prescribed her only “vitaminas” and “ibuprofeno”. When we asked her what was her secret, she told us not to worry about anything, that was the secret. She was clever and could understand everything that we were saying. I learned that day something that people live their whole lives without knowing. Another fact that marked my trip was on our second to last day of trip. We had a cultural day with the Hondurans in a remote place, which I unfortunately don’t know the name. We played many games with them, and they were willing to show us their culture and it was a great moment for us to show them a little from the American culture as well. After our “día de cultura” activities, heading back to the car in a 20 minutes walk, a little girl held my hand and stared walking me back to the car. 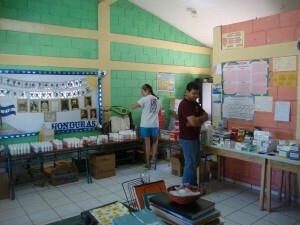 At first, no problems, because there were some other Hondurans with us so I thought she must be with them. But then they started walking to their houses and nobody called the girl to go with them. So I started getting afraid; “what if this girl is thinking that I’m walking her back home as if I know where she lives?” But ok, we kept walking, and talking along the way, when some one pointed me her house, so before she left I asked her for a hug. She hugged me and then I said “Dios le bendiga” (God bless you). I thought to myself “this was why I came here”. There is nothing better than a five-year-old, adorable kid who doesn’t know you but blesses you anyways. I think I will never forget her smiley face when she was saying goodbye and and wishing me a safe trip. On our last day of reflection, Andy, asked us for a word to summarize our experience, and I mentioned “wonderful”. I explained that I think it’s very interesting who in English words are put together to mean something. For example, beautiful – full of beauty, powerful – full of power; and our trip was wonderful – full of wonder, because it taught me so much in every single moment of it. 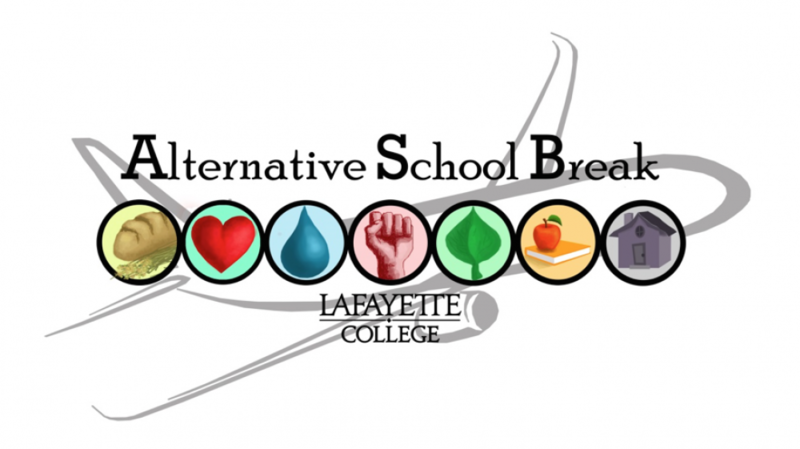 Yes, ASB Texas is the most rewarding decision I have made at Lafayette thus far. I am convinced that I am not finished discovering the impact ASB has had on me after 11 days back in Easton. On my trip, I learned that the potential rewards of embracing something with every ounce of effort I have. ASB Texas was so rewarding because I put forth the effort and wanted it to be rewarding. I can say I have taken that concept home with me and that my life and approach to situations in it have never been better. I had no idea what to expect while on my way to Texas. This forced me to dive into the situation with a completely open mind. I learned so much about Texas and the complications behind immigration in the United States that it has become a top interest in my mind. I have even found myself reading articles when I come across them to learn more from time to time. ASB was educational and showed me how much I can do to influence the big issues I will quickly grow up to eventually face directly or indirectly every day. I learned how much work it takes to truly understand something enough to make an educated decision about it. That has motivated me to want to share my experience with others who do not have a week to spend surrounded with information about an issue for which they are passionate. Working with locals and hearing their stories to dancing the bachata, I was exposed to a culture I have never truly known. Aside from the educational benefits, the benefits of cultural awareness have led me to have a greater appreciation for people most different from me. I could not be happier with the experience in Texas!